Objectives: (1) To review progress in the prevention of blindness in Sudan compared to Vision 2020 targets. (2) To show gaps and shortfalls. Materials and Methods: Reports of national Vision 2020 program covering the period 2003-2010 are reviewed, including data generated from six RAAB surveys conducted in 2009-2010. Results: Prevalence of blindness is 1% compared to 1.5% in 2003. Cataract surgical out-put, cataract surgical rate (CSR), and IOL implantation rate increased steadily. It is estimated that 70% of the population are covered with refractive errors services. Low vision services are provided by four centers. Trachoma mapping completed for Northern Sudan except Darfur. SAFE strategy is implemented. Prevalence of childhood blindness is not known. Two centers provide specialized pediatric eye services. There is community-directed treatment with Ivermectin (CDTI) in 3 out the 4 onchocerciasis foci. Ophthalmologists tripled in number. Optometists exceeded 1000, compared to less than 500 in 2003. Secondary and tertiary level facilities increased in major cities. There is no primary eye-care program. Conclusion: Northern Sudan shows good progress in most of the components of Vision 2020, namely cataract, trachoma, onchocerciasis, refractive errors, and low vision. However, scaling up and attention to diabetic retinopathy and glaucoma are still needed to reach all the targets by the year 2020. Purpose: The purpose of this study is carried out to analyze the change in intraocular pressure after cataract surgery. Materials and Methods: We conducted a retrospective interventional case series of 218 patients, who underwent phacoemulsification surgery. Pre-operative and post-operative, intraocular pressure, and pachymetry were recorded. The change in intraocular pressure was recorded in both operated and fellow eyes and was compared using the statistical methods. Results: There was a mean reduction of 0.93 mm Hg in intraocular pressure in operated eye, which was statistically significant (P value 0.004). The change in fellow eye was 0.31 mm Hg, which was statistically insignificant (P value 0.16). Conclusion: This study proves the significant reduction in intraocular pressure after cataract surgery. Objectives: To determine the magnitude and causes of avoidable blindness in 50 years and older population of Amran and Lahj governorates, Yemen. Materials and Methods: Using the RAAB manual, 78 clusters were randomly selected, 50 people aged of 50 ≥50 years were examined in each cluster. Visual acuity (VA) was measured with a tumbling "E" chart. Ophthalmologists examined people with <6/18 in either eye. A software program for RAAB was used for data collection and analysis. Results: In Amran and Lahj, 1789 (91.8%) and 1836 (94.3%) people were examined, respectively. The prevalence of blindness (VA < 3/60 in better eye, with available correction) in Amran was 9.33%, while in Lahj it was 10.84%. The principal cause of blindness was unoperated cataract in both governorates. The three main barriers to cataract surgery were unaware of treatment, destiny /God's will and cannot afford in both Amran and Lahj governorates. Conclusion: The prevalence of blindness, severe visual impairment and visual impairment in people aged ≥50 years in Amran and Lahj governorates were relatively higher than WHO's estimate in the sub region and the principal cause of blindness was untreated cataract in both governorates. 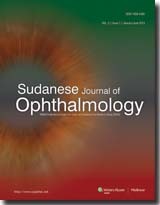 Objectives: To estimate the prevalence of avoidable blindness in people aged 50 years and older in Gezira state, Sudan, using the Rapid Assessment for Avoidable Blindness methodology. Design: Cross-sectional, population-based survey. Participants: Forty-three clusters of 50 people aged 50 years or older were selected by probability proportionate to size sampling of clusters. Households within clusters were selected through compact segment sampling. A total of 2150 eligible persons were selected, of whom 2103 (97.8%) persons were examined. Materials and Methods: Participants underwent a comprehensive ophthalmic examination in their homes by specially trained ophthalmic teams, including measurement of visual acuity (VA) with a tumbling-E chart and the diagnosis of the principal cause of visual impairment. Results: The prevalence of bilateral blindness (presenting VA <3/60) was 9.37% (95% confidence interval [CI] ±1.95) and the prevalence of bilateral visual impairment (VA of <6/18-6/60) was 3.9% (95% CI ±1.10) in the sample. Definite avoidable causes of blindness (i.e., cataract, refractive error, trachoma and corneal scarring) were responsible for 74.6% of bilateral blindness. 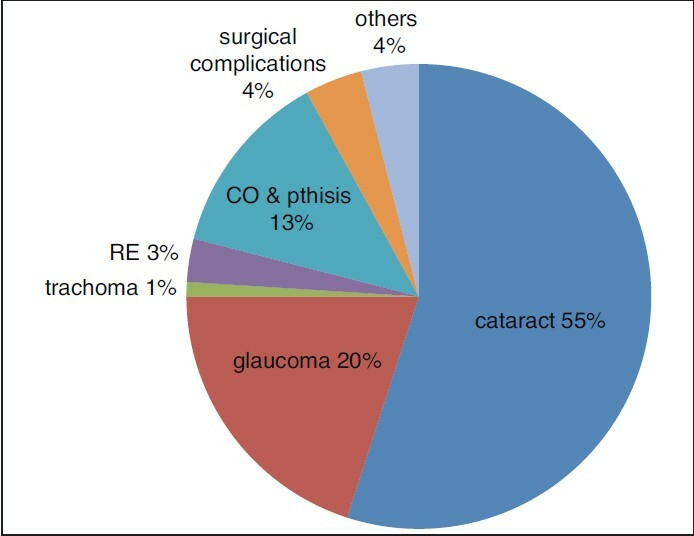 Cataract was the major cause of blindness (57.4%), followed by glaucoma (17.3%). Conclusions: The prevalence of blindness in people aged 50 years and older in Gezira state was slightly higher than that expected. Than main cause of blindness was cataract, followed by glaucoma. Three quarters of blindness was due to avoidable causes. Introduction: Macular edema affects approximately 29% of diabetic patients and constitutes the primary cause of visual impairment in this population. The combination therapy of grid laser and intravitreal triamcinolone acetonide (IVTA), the reaction mechanism of each therapy to macular edema is different; hence, not only greater effects on the reduction of macular edema can be anticipated, but also the stimulation of inflammatory reaction induced by grid laser could be prevented by anti-inflammatory reaction of steroids as investigated in several studies. Purpose:The purpose of this study was to assess the best corrected visual acuity after IVTA and macular grid laser in combination in cases of diabetic macular edema. Materials and Methods: A total of 50 patients of diabetic macular edema were enrolled in our prospective, randomized clinical trial study, grid laser, and IVTA was given to each patient in combination. The pre-intervention and post-intervention best corrected visual acuity was studied. Results: We observed 35 (70%) patients improved by 1 or more line on Snellen's chart, 12 (24%) remain unchanged and 3 (6%) deteriorated from baseline. The overall mean improvement in visual acuity was 1.08 with SD of ± 0.16. Conclusion: The results of present study showed a favorable influence of grid laser and intravitreal triamcinolone acetonide in diabetic macular edema. It improves and stabilizes the visual acuity in patients with the diabetic macular edema. Background: To evaluate the role of cryotherapy of anterior retina in preventing vitreous hemorrhage in patients with proliferative diabetic retinopathy (PDR). Materials and Methods: The patients were divided into two groups: (1) retinal cryotherapy without sufficient retinal laser treatment and (2) anterior peripheral retinal cryotherapy (ARC) in addition to sufficient panretinal laser treatment. The history and management of vitreous hemorrhage were recorded. Ocular examination and fluorescein angiographic findings for recovery of vision and presence of recurrent vitreous hemorrhage and neovascularization in the two groups were compared to determine the effectiveness of adjunct cryotherapy in PDR. Results:The rate of clearance of vitreous hemorrhage in groups 1 and 2 was 11 out of 13 (85%) and 15 out of 17 (88%), respectively (P = 0.717). In patients with cleared vitreous, the complete regression rate of neovacularization in groups 1 and 2 was 2 out of 11 (18%) and 8 out of 15 (53%), respectively (P < 0.05). Frequencies of the neovascular categories at different ocular sites in each group were similar, and no statistically significant difference was found (group 1, P = 0.884; group 2, P = 0.43). 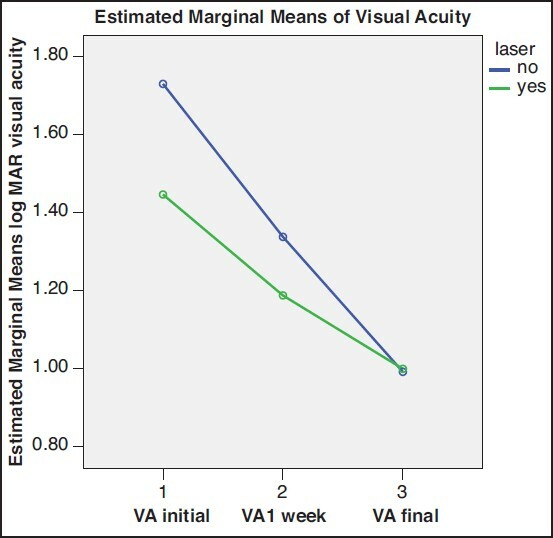 Comparison of corrected visual acuity on the last follow-up to corrected visual acuity before ARC gave the following results: 19 eyes had improved visual acuity of at least two lines, and visual recovery had similar distributions (group 1, P = 0.05; group 2, P = 0.085). Conclusions:It seems that ARC combined with photocoagulation might be a helpful adjunct procedure in PDR and to prevent recurrent vitreous hemorrhage.